ABC Radio Adelaide has bounced up from its horror last survey, but still trails its AM rival FIVEaa in every shift. Overall, FIVEaa flatlined but closed to within one percentage point of Mix after the music station lost listener share across the schedule. Survey 6 of the GfK ratings, released today, shows a significant improvement for ABC Radio Adelaide which had a disastrous previous survey. 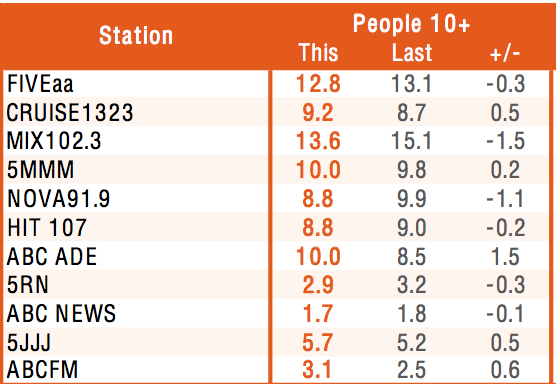 The ABC’s local station and Triple M are now locked in third place, just under three percentage points behind FIVEaa. Monday to Friday and Breakfast listener share. Source: GfK radio ratings, Survey 6, July 15 to September 22. FIVEaa has entrenched its lead in the important Breakfast shift, with David Penberthy and Will Goodings lifting their audience share to 15.6 per cent, giving them clear air ahead of second-placed Mix, hosted by Jodie Oddy and Mark Soderstrom. The ABC’s Ali Clarke, a former leader in the shift, improved her ratings to 12.8 per cent – up from 11.9 – to remain in third place. Overall Adelaide radio listener share. Source: GfK radio ratings, Survey 6, July 15 to September 22. The ABC’s biggest improvers were Mornings with David Bevan and Drive with Jules Schiller, but they were both coming off low figures. FIVEaa veteran Leon Byner remains the leader in Mornings, despite losing some share, while Mix rules Afternoons and Drive, again despite losing share. In the Evenings, FIVEaa’s line-up of Jon Blake followed by Jeremy Cordeaux opened up a massive lead with 17.3 per cent of share. Their nearest rival is the ABC’s Peter Goers on 11.8 per cent. The ABC’s improvement is based on a big shift in the 55-64-year-old demographic and an improvement among over 65s. Triple M improved its position to sit in third place overall, on equal footing with ABC Radio Adelaide. Classic hits AM station Cruise is next on the list of winners, improving slightly to jump ahead of Nova and Hit, who both lost share. Adelaide radio ratings, listener share for Mornings to Evenings. Source: GfK radio ratings, Survey 6, July 15 to September 22.